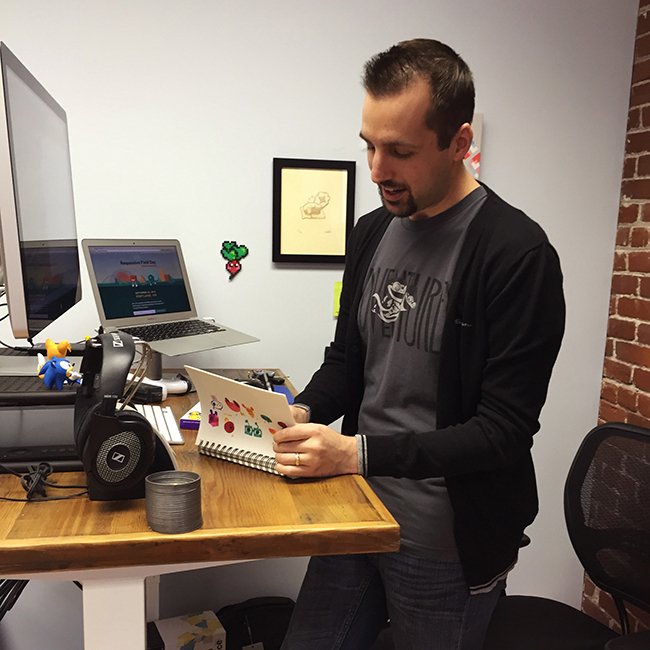 I'm Tyler Sticka, I design interactive things like websites, apps and games. 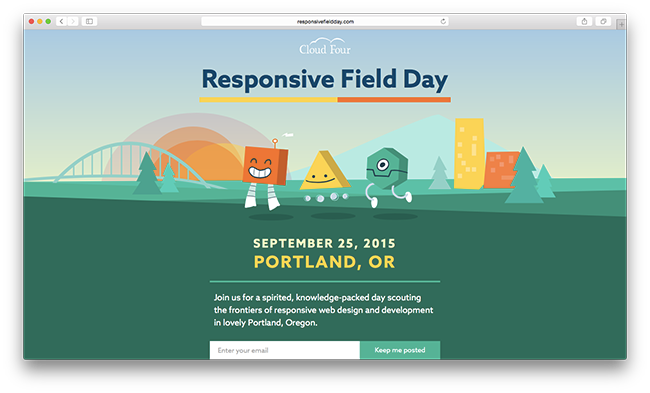 I work at Cloud Four here in Portland, crafting complex responsive interfaces with companies interested in making the most of the modern web. I'm also one-half of Backabit, a scrappy little indie game company. We've released two games for iOS (Ramps and Lotsa Blocks), with one or two more in various stages of prototyping. 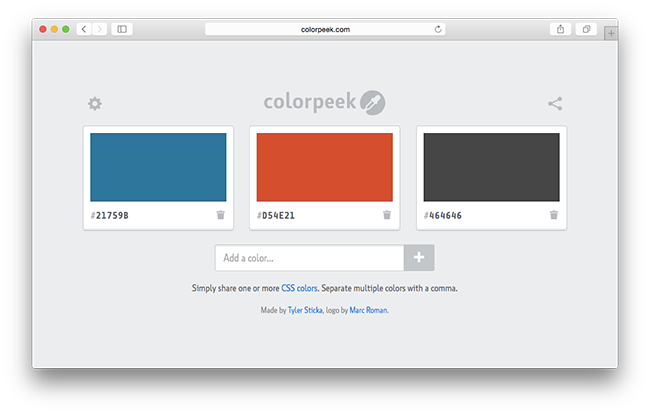 I also make tiny web apps when inspiration strikes, the most recent being Colorpeek (and its Chrome extension), which I introduced on CSS-Tricks. I blog at tylersticka.com, and I recently started sharing my sketches, drawings and doodles on Tumblr. 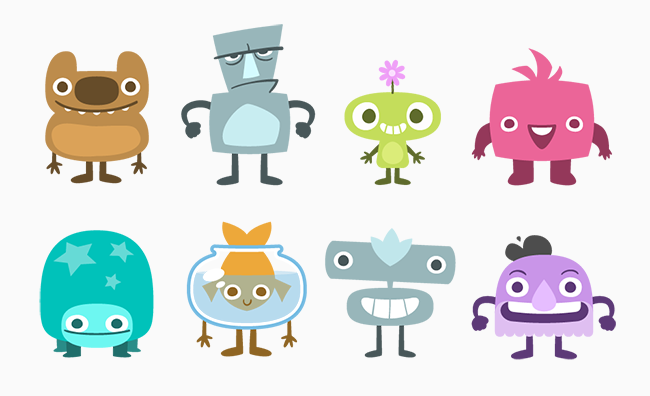 Avatar designs for childrens' app, © Giftr, Inc. I've been drawing for as long as I can remember, but my love of cartooning accelerated when an illustrator named Ray Nelson, Jr. visited my second grade class. A few years later, I learned the basics of HTML from a library book. But those interests didn't really converge until I read Scott McCloud's Understanding Comics (breaking down the mechanics of visual storytelling) and Reinventing Comics (hypothesizing how those mechanics might be applied to new technology). In high school, I apprenticed in an Industrial Design program at Art Center in Pasadena and later worked as an intern designing CD-ROM interfaces for Intel. These experiences really proved to me that design could be a rewarding career for someone with seemingly contradictory interests in art and technology. TL;DR: I was a geeky kid who loved comics and computers! 2011 was a particularly memorable year for me due to two big turning points. In January, Apple featured Ramps on the App Store homepage, calling it "a simple and stylish physics puzzler that you won't want to put down." The response to the game surpassed all our expectations... even Dwight Schrute liked it! As that was happening, I was wrapping up the design effort for the 2011 Sasquatch! Music Festival website. It was an ambitious project, one of the first corporate-sponsored responsive redesigns. It launched just a month or two later, increased users' exploration of the festival lineup in a measurable way, and was shortlisted for net magazine's Redesign of the Year... losing to some upstart called YouTube! I love my home office. My PC, desk and chair (a modified truck seat) are all customized to suit my lanky frame and persnickety brain. 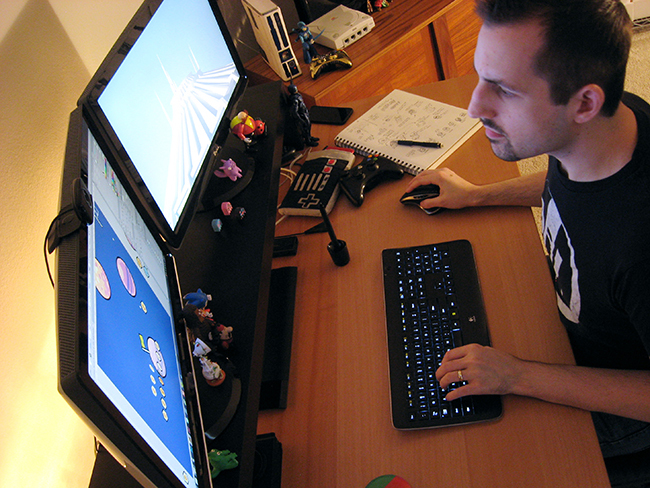 There's ambient lighting behind my monitors, which gives the space a really comfortable, warm vibe. I feel most creative when I'm surrounded by things that inspire me, so while my workspace and supplies get priority placement, nearly every other bit of space is occupied by comics, toys, games and other little totems of geekery. Sometimes all it takes to overcome a creative block or psychological impasse is a quick swivel of the chair or glance around the room. No disrespect intended toward my previous employers, but Cloud Four is the first job I've had where I don't miss my home office constantly while working on-site. We have great gear, lots of devices for testing, and these amazing electric desks that adjust to custom heights for sitting or standing. It's teaching me the habit of getting up and moving more often, which is super beneficial. And obviously, it's nice to be able to pick my coworkers' brains or quickly sketch out ideas in-person! I find constraints oddly helpful. Those who work with me know that I'm my own worst critic, so knowing the limitations of the medium, the technology, the schedule or even the audience allows me to focus my energy on what's possible or realistic to address within those guidelines. This is why I tend to write more code than most designers... I feel it's the only way to truly know what a platform can and cannot do, to avoid designing inappropriate patterns simply out of ignorance. I find comics and video games inspiring partly out of nostalgia, but mostly because they are deceptively complex, visual mass media that require involvement of the reader or player to progress. Steph Hay recently wrote about the first minute or so of Animal Crossing: New Leaf, and that's a great example of a video game solving the same basic problem as a sign-up form (ugh!) but feeling straightforward, organic and entertaining. It's amazing! I also find music inspiring (Blur, Pixies, The Fall, Wilco, Wire, Talking Heads, The Beatles, The Kinks), but I imagine that has more to do with its mysterious and visceral emotive powers than any profound relevance to my profession. Or maybe I just need to spend more time rationalizing that interest! Portland has a wealth of great comic shops, my favorites being Floating World and Excalibur (both are great stores to visit if you're just getting into comics). Ground Kontrol Classic Arcade is a fun place to lose some quarters. Retro Game Trader in Beaverton is a wonderful shop if you're into classic games, and the staff there is super welcoming and helpful. There are also a handful of great concert venues, though I seem to see fewer shows ever year (and my days of attending music festivals are almost certainly behind me). In spite of my terrible allergies, I will occasionally venture into nature to explore a place like Silver Falls (often on a "guys trip" with my dad and brother). It's a good excuse to unplug (something I should really do more often) while taking in some beautiful sights. While I don't come close to Louie Mantia levels of fanatacism, I really love Disneyland and try to visit every few years. I inherited that interest from my parents, which intensified when I got a tour of Walt Disney Imagineering as part of my high school apprenticeship. There's a great GDC talk from a few years back called Everything I Learned About Level Design I Learned from Disneyland, which I highly recommend watching. My wife and I stayed in Paris and London for our honeymoon and really enjoyed it. We'd love to visit Europe again. I still admire a lot of the web designers that inspired me in college: Jeffrey Zeldman, Dan Cederholm, Andrew Clarke, John Hicks. I look up to folks like Dan Mall, Frank Chimero, Jessica Hische, Jason Santa Maria, Ethan Marcotte, Scott Jehl, Chris Coyier, everyone at Paravel. I love Cap Watkins' way of thinking about design leadership, and Sara Soueidan's recent SVG posts have inspired me to dig deeper into web technologies I take for granted. Val Head and Rachel Nabors challenge me to incorporate animation into my interface work more than I have been. I love everything Brad Frost, Anna Debenham and Susan Robertson have contributed to the practice of designing style guides and pattern libraries. Sergio Aragon?s is my favorite cartoonist because he makes me laugh most effortlessly, and has since I was a kid. Stan Sakai's Usagi Yojimbo is an unerringly consistent master class in visual storytelling. Mike Allred's work looks on the surface like pop art, yet stands on its own (often strikingly so). Mike Mignola renders stunning images with such economy, it's truly remarkable. I love how Sam Kieth's artwork looks like an "outsider" artist and a traditional superhero artist fought over paint and India ink. I've read almost everything Lewis Trondheim has done that's available in English. Osamu Tezuka's Black Jack is incredible. I will always adore Peanuts by Charles Schulz. Nintendo gets a lot of flack lately for not churning out buckets of free-to-play smartphone garbage, but their games are still magic. My favorite American game company is Double Fine (go play Broken Age, it's great). I'll play anything Michel Ancel designs for Ubisoft. And Threes might be the best puzzle game since Tetris (if you play 2048 instead, you are a goober). I'm also lucky to have worked with a ton of amazing people that continue to inspire me as much as anyone above. I won't list them here for fear I'll forget someone... but if you're reading this, thank you again for being awesome!